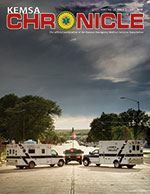 The KEMSA Chronicle magazine is distributed to members of KEMSA, which are licensed EMS professionals in the state of Kansas and outside the state of Kansas, as well as local and state agencies, legislators, service providers, and Kansas educational institutions including Kansas community colleges. The KEMSA Chronicle is published four times each year. 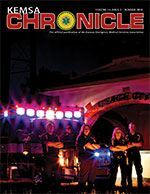 Regular features of the magazine include: a president's message, a service spotlight, service chronicles, event previews, event wrap-ups, membership news, and much more. 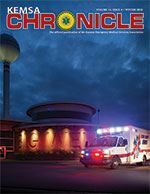 Special features include: Annual Conference information in the summer issue, and a conference wrap-up with photos and award winners in the fall issue. If you aren't a member, join today to make sure you get the next issue! Learn more about membership here. Full issues of the magazine are available for members in our members only section. For a preview of each issue, click on the cover image below to view a table of contents. 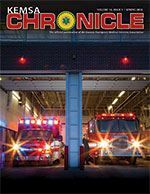 To download the service spotlight article, click on the EMS Service name.